Imagine a world where cars never collide; where accidents just don’t happen; and where cars talk to each other and to the road. 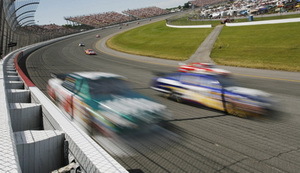 Yesterday, Michigan officials announced that they’ll be working with the Michigan International Speedway (MIS) to test two emerging technologies–vehicle connectivity and intelligent highways–that would make cars virtually crash-proof within the next five to seven years. I predicted a long time ago that cars would drive themselves by the year 2020. Now it looks like it might happen sooner. These technologies, when fully developed and taken all the way, will eventually permit drivers to jump in their cars and essentially tell them where to go. The car does all the work while the passenger is free to sleep, work, or eat. I’d probably use the time to answer e-mails and watch movies. Suddenly, commuting won’t be such a pain anymore. Sure, people who enjoy driving will not give it up easily, but eventually no one will be operating their own cars. With this new technology, car accidents could be reduced by 80%. Insurance rates will most certainly plummet. Original article that appeared in The Detroit News after the jump.